2019 SCOTT CAT. EVANGELION, 10TH ANNIVERSARY (A)". (THOUGH JAPAN'S PERSPECTIVE OF PERSONALIZED. so that you are aware of what you are buying. my pictures are not the best but I try to make sure that all the. ). From 50 gr. to 100 gr. 2019 SCOTT CAT. SHOTARO CHARACTER WORLD". (THOUGH JAPAN'S PERSPECTIVE OF PERSONALIZED. "HAPPY FACE/. any other type of collectibles nor do I claim to be one. my pictures are not the best but I try to make sure that all the. ). 2019 SCOTT CAT. (THOUGH JAPAN'S PERSPECTIVE OF PERSONALIZED. THIS WOULD MAKE A GREAT ADDITION TO. were adjusted, we will make & notify you of the correction. my pictures are not the best but I try to make sure that all the. ). "GREETINGS/GODZILLA, MOTHRA 2019 SCOTT CAT. (THOUGH JAPAN'S PERSPECTIVE OF PERSONALIZED. THIS WOULD MAKE A GREAT ADDITION TO. were adjusted, we will make & notify you of the correction. my pictures are not the best but I try to make sure that all the. ). 2019 SCOTT CAT. (THOUGH JAPAN'S PERSPECTIVE OF PERSONALIZED. 2004 PROFESSIONAL BASEBALL. so that you are aware of what you are buying. my pictures are not the best but I try to make sure that all the. ). Japan Sheet NH Scott 293a Lot of 4 Souvenir Sheet with its original folder. Full Sheet. All in good condition. Dated 1967. I do not have a book on the Scott Numbers. Folded in their original envelope! The stamp you see is the one you will receive. More being listed Now! NOTE : This is the Full Sheet. Not all fit on the scanner! PHILIPPINES Sheet of Cinderella Stamps/Labels: Fathers Burgos, Gomez, Zamora From a newly discovered hoard: Very scarce sheet of Cinderella stamps/labels depicting the life and death of Philippine martyrs Fathers Burgos, Gomez, and Zamora, who were executed by the Spanish. This is a large sheet of stamp-like labels, of high printing quality, and perforated. Stamps were printed and sold in the Philippines, and were not seen before in the USA until now. Sheet will be shipped rolled. Sheet pictured is only representative of actual sheet you will receive. I will select the best centering for you if you buy early. Don’t miss your chance to own this scarce and educational sheet! It is used for scanning. But we will appreciate it. to protect both of us. 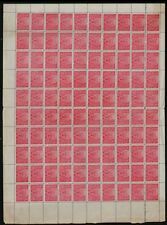 MNH (Mint never hinged); OG (original Gum);. Check the scanned picture (Front & Back)! What you SEE is what you'll receive. At the top of the sheet are the characters 〝共拯饑溺〞 (Cooperate to rescue the starved and the drowning). On the left side the characters 〝中華民國三十年〞 (30th year of the Republic of China), all in Regular-Writing characters. 1991, Viet Nam Democratic Republic. 10 sheets, each one containing two miniature sheets of six (20 minisheets). Condition: MintNever Hinged / MNH. 1991, Viet Nam Democratic Republic. Locomotives, 25 Souvenir Sheets. The photos show the actual product you will be receiving. Not Dated. I do not have a book on the Scott Numbers. Folded in their original envelope! The stamp you see is the one you will receive. More being listed Now! Dated 1967. I do not have a book on the Scott Numbers. This sheet does have a slight gum disturbance on one spot as seen in the photos. The stamp you see is the one you will receive. More being listed Now! Dated 1967. I do not have a book on the Scott Numbers. Folded in their original envelope! Slight tear in the edge of the sheet. The stamp you see is the one you will receive. More being listed Now! 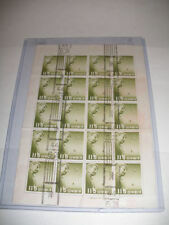 New ListingRYUKYU Islands, Full Sheet, 1967 MINT, 20 Stamps, 3 Cents,Japan Postage, Bus!! 1992, Viet Nam Democratic Republic. 25 Souvenir Sheets. 1992, Viet Nam Democratic Republic. Complete set of 6 in full sheets of 25 (25 complete sets). CHINA Liberation 1949 Sc#3L82-88 Chairman Mao Set Mint Never Hinged. 511 South First Ave Suite 132. 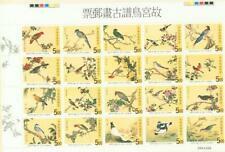 China Birth Centenary of Pan Tian-shou artist SG#4176.